Golygfa'r Cwm01654 782674work Self-cateringChalet No. 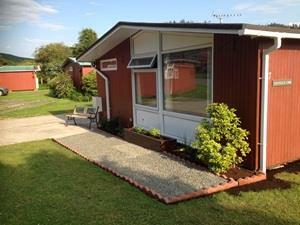 57 is a typical single storey holiday chalet on a Park of similar chalets not far outside Tywyn, Gwynedd. Ideal base for all kinds of seaside and country holidays. The Park is peaceful, surrounded by trees, and Tywyn can be reached in a few minutes. Aberdovey only a short drive away. Combined entrance hall / dining room, with dining table and four chairs. Windows on three sides give views of trees and hills, the backdrop of the well-kept Chalet Park. Well equipped Kitchen with refrigerator, electric cooker with four hobs and grill, There are all the usual items of kitchen equipment including microwave, electric toaster, slow cooker and all the crockery and utensils four people need. Lounge with wide windows. Comfortable seating for four adults, a TV set with Sky & recorder; electric heater, and coffee table. Two bedrooms and bathroom makes the whole chalet compact and convenient. One bedroom has a double bed, wardrobe/drawers and electric heater. The other has twin beds, a chest of drawers, chair and heater. All linen is provided. The bathroom has a shower over the bath with integral seat, wash basin and w.c. Your chalet has a small lawn at the front, with garden seat and garden furniture backing onto a flower bed. The lawn continues on the right side and round to the back. There is parking for a car on your own concrete area.